Working Not Working is excited to be sponsoring this fall’s ADCAN Awards show, which takes place next Thursday, October 18th, at The Mill in Los Angeles. Ahead of the event, Team ADCAN gave us the rundown on their mission, past success stories, and what you as creators can do to join the ADCAN movement and use your creativity as a force for good. WNW Members: Use the password sent to you in our weekly newsletter to get discounted tickets to the ADCAN awards show. What is ADCAN’s mission? What was missing that ADCAN is taking up and delivering on? Our mission is a very simple one - to inspire others to use their creativity as a force for good. Yes we do have an event, and yes we do award work but that’s really not how we think about ADCAN. 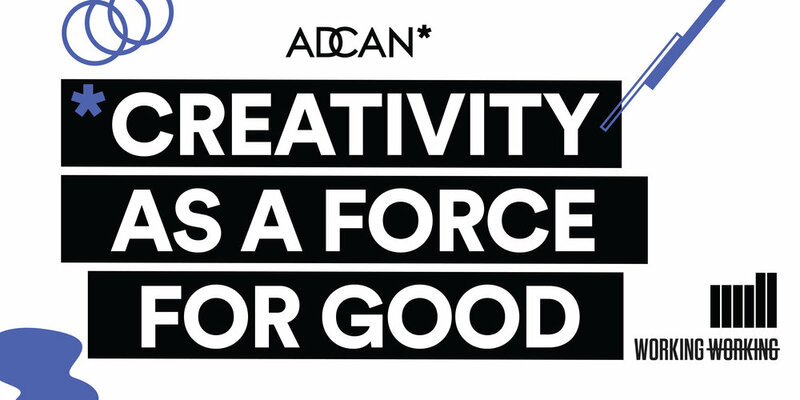 ADCAN is a global community of individuals with a view to use their talents for good, which extends way beyond the show and workshops. Our real job is to facilitate and create space for good things to happen. ADCAN is a symbiotic model. What you put into it will ultimately benefit you but it will also have a positive and much larger side effect on someone or something. What do you see as the responsibility of an artist in addressing social issues through their work? This is a responsibility we all have and where we see the Artist coming in is through the ability to approach social issues in a playful way. In the Information Age, the survival of our species is not going to be a result of having a lot of data; instead it’s going to be what we can creatively communicate with all this information. We believe the artistic and creative minds coming up now will be the ones that inspire others to get involved. Are there any standout success stories from past years that showcase what ADCAN is all about? Every year there are success stories in many different forms. For example, last year we even had a character from one of the films become the official spokesperson for one of our charities. However, the way we as a team define success is in the stuff we don’t see. Each season an entire new collective of people join together from all over the world to do good. Sort of like new synapses forming in a human brain. These relationships lead to new ideas, new thinking and new ways of doing things that effect the world in ways we often don’t get to see and that’s true success. What’s ADCAN’s process for selecting the list of judges? It’s a very secretive, complex and long process (nope, not at all). We’ve been working with people who share the same passion, vision, and desire to give back. We are so lucky to have all our judges who we are constantly asking for advice, help, and mentorship from. All of them donate their time to do something much bigger than themselves and give back in such an inspiring and positive way. We are always open to having more people in the larger ADCAN family with the same enthusiasm for positive change. How big is ADCAN’s internal team? Do you come from both creative and charity/nonprofit backgrounds? ADCAN is an expanding and contracting team of volunteers from Budapest to L.A. Everyone involved with ADCAN does this in their spare time and what we collectively pull off year after year is nothing short of amazing. We mostly all come from creative backgrounds, with new people getting involved all the time. At the end of the day we’re really just one big modern family and once you’re in, you’re in for life. This is the first year ADCAN presented an open brief. Can you talk about about what this means and why you decided to do this? As mentioned above, we’ve never really thought about ADCAN as an awards show, so this was an opportunity to express that in a more tactile way and open the notion of creativity as a force for good to anyone, anywhere, in any medium. We were really lucky to partner with March for Our Lives to judge the entries against this incredibly important brief and the response has been incredible. What do you do to encourage attendees to connect with each other? How do you cultivate a sense of community that they can take with them? You don’t show up to a march to watch it - you march. We like to think of ADCAN like that. When you’re at the show, you’re not just passively sitting there and watching stuff take place. We are all about action, whether that’s making work, mentoring, or volunteering. By being there you are already part of the contribution so don’t be afraid to put up your hand to get involved. What other advice do you have for attendees to help maximize their ADCAN experience? Leave fear at the door and come with an open heart and mind. The rest will take care of itself. How does ADCAN capture the spirit of the creative scene it’s hosted in? We really don’t capture anything. There has to be room for experimentation, playfulness, and creativity. We work really hard behind the scenes to ensure that we can create a space for that to happen. The Mill have been incredible partners from the start and do a TONNE of heavy lifting to make sure the grass is cut and the field is ready for everyone to play their best game. Where do you see ADCAN 3 years from now? We could say something about where we think we’ll be - but like life, no matter where we are or what we face, we only have to take care of this moment and that’s it. Discover more creative talent, projects, and events like this through Working Not Working. If you're a WNW Member with new work, exhibits, products, news, or opinions to share, email us.